Ok, so I have the settings for my cold and warm pressure, system pressure and control pressure. You cannot see it clrearly, but the system pressure is at 3.6bar initially and when engine starts it drops to c.a. 2 bar on the dial. Engine is cold (after night). Engine jumps to c.a. 1500 RPM when cold, no issues with starting as you can see. Runs smooth, no backfire, nothing - so I'm thinking I'm home, getting close to a ride! This is my second attempt. After first one and few minutes operating the engine was flooded and died. I removed spark plugs and revved the engine with starter motor to empty cylinders from excess of fuel. This is starting when warm. Fuel pressure around 3.7 bar. RPM jumps to 1200, no issues with starting, runs smooth... For c.a. 2 minutes 30 seconds. RPM drops to 900 and flooding begins. Dark smoke from exhaust, misfires. Making any enrichments with CO2 adjustment screw makes the engine run worse, floods the engine - the screw needs to be completely unscrewed to lean. About 30 seconds later after I finished filming there was much much smoke and the engine died... flooded. Fuel pressure was c.a. 3.85 bar at that time, when engine died. What I started considering is connecting the RPM drop with flooding the engine, and this brings me to DITC. Old rule says, if the engine won't start, either lacks fuel or spark. I'm sure there is plenty of fuel in my engine, so I'm beginning to track spark. At that stage I knew there is kind of ECU controlling my spark, did not know its DITC, but having some experience with different modded cars and stock cars and old cars and a bit of bikes, I know that I need a vacuum advance pump on spark dizzy to advance or retard spark, or if there is none - ECU, that will do that for me. So I started checking my manuals, paper ones... Did not find anything about DITC there. But these were N/A + some addendum for Turbo. Cleaned the connector with some electronics cleaning solvent, resoldered the connector on the DITC board, finally reached to the GND points above fuse/relay box. It seems the GND connection there helped a lot, and I finally got repeatable strong spark every time on every spark plug. 3. I'm taking my scope with me for the upcoming weekend. Could DITC really be the issue, retarding the spark too much and causing non stoichiometric combustion? I may forgot something to write above, like when I added some extra air by detaching brake cylinder servo hose it was bit better and more RPMs (just remembered that! ), but anyway you kind of got my story here. Don't have a photo of that, but the bi-metal spring was mounted up-side down. RPM jumps to 1200, no issues with starting, runs smooth... For c.a. 2 minutes 30 seconds. RPM drops to 900 and flooding begins. Dark smoke from exhaust, misfires. Are you sure you didn't put that bimetalic strip back in backwards? That would explain getting richer with time from when you start it, rather than getting leaner with time..
Control pressure should be low with a cold WUR, higher with a hot WUR..
Higher control pressure resists airplate movement more the higher the pressure gets..
"You cannot see it clrearly, but the system pressure is at 3.6bar initially and when engine starts it drops to c.a. 2 bar on the dial." 1. I think you are confusing system pressure with control pressure here, system pressure should never change and is the higher pressure spec, valve closed..
2. Control pressure (WUR, valve open) should be low before starting and then climb after starting..
Connect the tester with the valve open, make sure you have it on the correct fuel line for the WUR and make sure it is in the right order..
With the valve open start the car, that pressure should rise as the car warms up..
Another thing.. Your phillips screw there you are adjusting your AFR screw with, that isn't going to work for a lot of reasons..
You should get that and the rubber part out of there..
Get that out of their and down the hole their is a female hex allen that you adjust with an allen wrench.. It is not connected to the housing but rather is on the linkage the airplate rides on.. 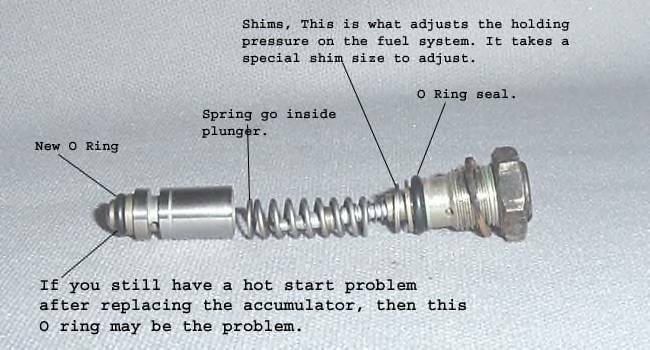 Even if your phillips screw is just a tool to reach the adjuster, the tool can't stay in there on it because the adjuster is a moving part..
Another thing, you need a plug for the hole, but you cannot be touching the adjuster with anything (other than at idle) while the car is running, because it moves with the airplate.. The hole needs to be covered so you aren't sucking air in there, uncover it to make adjustments, remove the tool, cover it back up to stop the vacuum leak, observe results of the change you made after you recover it..
What is on the end of that screw you are using? The hole in the upper AFM housing there is an access hole, not a threaded hole a bolt is supposed to be in.. It definately looks like you are using the hole as a nut against your phillips screw to push down on the linkage.. That is NOT how it works.. Yes if you push down on the linkage it will make it richer, but that will only serve as a backstop and hydrolock your engine again.. Seriously that could hydrolock your engine putting a screw in pushing on the AFM linkage! Don't do that.. If you put a screw in there with the fuel pump power jumped on, adjust it down so it gives you more fuel, engine dies, injectors are still spraying because your screw is holding it open, bam hydrolock more bent rods..
That could be your whole problem right there, or your WUR has a backwards metallic strip in it too.. Don't know yet..
Means you were too rich and a vac leak improved your AFR..
You see how the linkage is connected in the middle by a seperate carrior.. The AFR adjustment screw adjusts one part of the linkages position in relation to the other, and they both swing.. 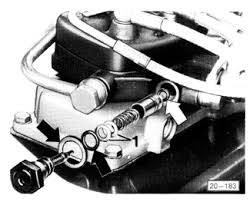 This diagram is of an updraft airplate rather than our downdraft airplates but it illustrates the AFR screw in there..
Get that screw out of there, find a cap for the hole, find the right tool to adjust the AFR screw with, get the tool out of there and cover the hole back up before you blip the throttle or anything.. I do like how you are pushing on the airplate by hand however.. If you get it to idle then pushing on the airplate makes it richer.. So you can easily test and see what way you need to go with the AFR screw.. If you push on the plate and it runs better you need to go richer, clockwise, withe the AFR screw.. If you push and it makes it worse then you need to go leaner with the AFR screw.. The actual screw is very sensitive by the way.. 1/8 turn gives noticeable differences..
5. Turbo (tested with foot air pump), warm, fuel pressure drops from 3.7-3.8 to c.a. 2.9 at 0.5bar "boost". I'm pretty confident of my pressures here. Good point, I wanted to clean that install anyway, but you're right - it may complicate things. Firs thing to do during the weekend then! I was checking the injectors with fuel pump running and pressure plate "stable" and adjusting this philips screw. When it was screwed in just a bit - here we go, injectors leak - so it's unscrewed completely now. Will definitely clean that up. I'm pretty certain it's not WUR, as my pressures rises from cold to warm as intended. Drops under boost as well. I definitely will straighten that out! Many thanks for good hints! PS. What kind of AFM is that in the video? I've read that Carrera GTR used a 928 fuel distributor with fuel line connected to 2 "fuel sockets" on the distributor per injector. Adjust, value: 6.0...6.3 bar "
You say you get 5.5 bar.. That's a little low but I don't think too low to run decently.. This is pretty easy to raise up to spec by adding another small washer/shim into the system pressure regulator pop up valve..
Spec- "Control pressure cold (approx. 20° C): 2.4...2.8 bar"
You- "2. Valve open, cold, fuel pump running - c.a. 2.0 bar at 20 deg Celcius outside"
A little low but it will come up some when you raise your system pressure to spec.. Pretty good but you might have to bump it down a bit after you get your system pressure up..
Another thing that could be causing your problems would be a faulty cold start valve CSV.. It is just like an EFI fuel injector - you probably know.. It could possibly be sticking open and dumping fuel into your intake manifold all the time your fuel pumps are running..
You should pull it out and make sure it is not leaking with fuel pressure behind it.. I don't recall you mentioning it yet..
Could possibly be abnormally high pressure back there or just a degraded old fuel line.. If your fuel pump flow tests within spec I think you are good.. These fuel pumps will put out serious gauge bending pressure if the line is blocked though.. I'm not sure what to make of that.. If you aren't blowing your fuel pump fuse, proper fuse, then it can't be because you are drawing too many amps through it I don't think.. Probably just a faulty old relay? Standard 4 prong relays will work for testing but do not have the fuel cut safety circuit so you shouldn't really drive with them installed..
GTS not GTR I believe but right.. The GTS used a V8 fuel distributor with it's 8 ports "saimesed" to 4 injectors.. It was K-Jetronic basic, with a WUR, no lambda.. Like your 931 CIS.. The AFM in the video is from a late 80's V8 mercedes 560SEL with the latest iteration of CIS, CIS-E/KE3/KE-Jetronic, no WUR, and sort of a very advanced lambda designed for fuel trims to be completely adjustable electronically with an ECU, much like EFI.. The last of the evolution of CIS.. I don't want to distract from your situation with it but you asked.. I just wanted to show the linkage.. I'm not sure if my CIS is S2 gen. I've checked the WUR and Distributor numbers, matched with the tables here and setup according to these values. I will play a bit with these pressures when I get my 931 running - I'll plug wideband lambda and see how it works. Maybe even take it on dyno. Now it makes no sense - it will kill my o2 sensor. Been there, done that It was running at 5.0 bar when first checked. Rised to 5.5 which is within the above specs. Spec- "Control pressure cold (approx. 20deg C): 2.4...2.8 bar"
Another thing that could be causing your problems would be a faulty cold start valve CSV.. It is just like an EFI fuel injector - you probably know.. This piece of rubber had a sign of time on it, so I suppose it was meant to fail anyway. Better in garage than on open road. I will either replace the fuel pump relay (switch/board) later. As this is not a regular relay by itself, or just the relay within it. Whatever will work easier for me. Seems the contacts lost some kind of gold/platinum coating and high amperage just welds these together. Typical for old, used multiple times relays. Indeed, and that's the beauty of classic cars in general! Methodological, takes time, but you can be certain that the thing you're messing around is really the thing that matters. I phoned my father to check if there is allen screw under this "installed by who knows who" philips screw. And it is. 3mm allen screw is there. Replaced 5 elbows and some lines to brand new silicon ones. But... First things first - CIS. And finally checked if P/N matches the Distributor, WUR and so on... All fine. So I started adjusting the CO2 to the initial position as Manual states, I even recorded that but it's too boring to publish it. Anyway I disconnected one of the fuel lines going to injector from fuel distributed and going clock wise reach the point when fuel started appearing distributor outlet (fuel pump running). From that point I went 1/2 turn CCW. I've added a shim to System Pressure - it's now c.a. 5.9 bar when running. 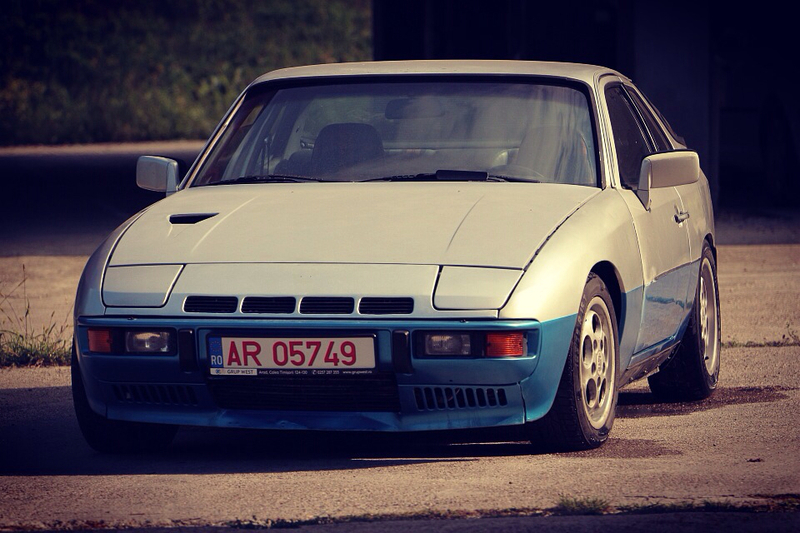 Today my 931 had some issues starting also when cold... But there is progress. Previously when warm I could not start her at all. Today after the above CIS works it changed. When warm the engine started. Had issues with that though, but there was no smoke from exhaust, there is no smell of fuel excess in the air. So I made assumptions - now my fuel pressures although not perfect, kinda' work. So many thanks for guiding me to this philips screw that I just ignored God knows why. So let's leave the CIS fuel pressures for the moment just like they are. It's definitely better, but it seems the mentioned before DITC is another nightmare. So when my engine started, either cold or warm it was misfiring, well it still is. I had this feeling there is something wrong with DITC already, but today it was 100% hit. Or maybe it's the ignition module... Or both. 4. When accidentally moved DITC (laying on carpet near gas pedal) by my foot RPM dropped and engine almost died. Did that again, and again - I was losing some sparks when moving DITC or it's wiring harness. So I decided to reflow the DITC plug wire connections to plug pins. PIN 12 is brown and brown/red (that one goes to IAT sensor) brown goes somewhere to ground, but did not track it down (not even tried). I think we need to assume I have a mix of pre 1981, S1 and S2 in here. Anyway I made sure I have really good contact between DITC and wiring. Checked with solder points and plug wires - I'm 100% sure there is connectivity between wires and DITC board solder pints to the plug. In the meantime I checked and the connection between vacuum and vacuum sensor in DITC was not 100% sealed. Repaired that obviously. What bothered me was also if the vacuum sensor is working. There are two wires (copper) going to the sensor, so I measured the resistance between them - 12.7 Ohm. No idea if it's good or bad, but I wanted to check if this thing changes with vacuum change. So I sucked as much as I could - no change. So I'm pretty certain this thing is not working properly. Maybe something "glued" inside. I have poured some electronics solvent into it and I'm leaving it overnight - maybe it will react to vacuum tomorrow. Who knows. In the meantime I verified the wires going from DITC plug to engine bay (IAT, Ignition module, ground). All seems fine. So I thought let's give it a try... I started cranking, and nothing. Not even willing to start. So I thought maybe I flooded spark plugs. Removed them and decided to check the spark and rev the engine to remove excess of gas. There was NO SPARK at all. Started moving the cables around DITC plug, haven't seen any change. So I asked myself a question - what did I touch? Well the ignition module. Cleaned the Ignition module plug and pins with contact cleaner, moved it in and out few times, added a bit of copper grease. It helped, a bit. The spark is back, but it's weak and sometimes looks like not always on all spark plugs (when these out). The good point is even when warm it kinda starts (as opposed to last week). The bad point is last weekend when cold, engine started from touch, jumped to stable 1500-1600 RPM and when warmed up dropped to stable 900 RPM. So I decided to connect my strobe to see how the spark advance behave. I'm really worried at this point about my spark / DITC. Will try to buy new Ignition module during the week and replace it the next weekend, as not sure if this is DITC or Ign module that is faulty, or both. For sure there is something wrong with Vacuum sensor - have any of you ever checked the Resistance of it with vacuum/boost or no force attached? I'l try to do some more checks tomorrow, but this brings me to other conclusion. - I have a spare MegaSquirt 2 laying around. I could make it work as my alternate Spark controller (instead of DITC) with some work, maybe use EDIS coil to drive spark with it. - I've seen some of you guys are running MS with 931 - are you using the factory sensor on the flywheel, to get crank position, or you have added additional 36-1 teeth trigger wheel (or similar) and VR sensor? It might be a challenge for me to get a spare DITC in Poland (either to borrow or to purchase) to connect another one for verification, so I'm thinking about MS2 (which I know quite well as my other car runs EFI and EDIS with it). I wouldn't blame you if you dumped the entire CIS and ignition and went with the MS..
What do you think that would do to your car's value over there? Their may be some merit to staying more original.. I'm just running fuel only with my MS so far.. I'm a MS newb.. I'm getting my tach signal from the VR sensor in the distributor, because I don't need a pickup very accurate to crank position.. But I will to take over my ignition some time.. I have read of some people locking their distributors solid.. Removing both the centrifugal and vac timing modifiers from it, and using it for their crank signals.. But I think this only works for pre-DITC distributors and still gives a slightly inaccurate position due to the cambelt.. I think the trigger wheel, like Dan has in ideola's garage, is probably the best solution. If I had DITC I would probably be trying to figure out how to use it as a pickup, or another sensor that you can use in it's place.. On the flywheel.. I'm not 100% sold on the trigger wheel because it's too big, too unoriginal like, and I can't afford to loose any more space in between my radiator and serpentine pulleys because my RAD is spaced so far back to fit my IC in front of it.. I'd probably have to go to an aftermarket rad fan.. I'd like to take over my ignition in a sort of "stealth" manner, leave it looking very original.. Probably even leave the vac lines on it.. Lock it, fire it from the original coil or an upgraded coil.. I could go COP but is it really worth the small performance advantage? And it would be awful for my look.. He invented the FrankenCIS code and parts.. A while ago he was talking about a way to fire the OEM Porsche ignition boxes from MS, but I don't know if it's ready or not for what boxes or anything, it was probably for 928s or 930s.. He is very good at responding to PMs though so maybe ask him about that, I would like to know too..
their are a few old threads here with people taking EDIS systems and putting them on 924s, they are there but I haven't studied them.. I haven't dove 100% into the ignition research yet but if you do this i'll basically be right behind you.. I would most like to put a magnet or 2 on the back of my crank pulley and a sensor behind it just the way it is, but I don't even know if that is possible.. I'm also of no help with DITC.. It looks like you do good work, serious diagnostics, and have a good mind for engines.. It's pretty rare that someone comes here, just correctly built an adjustable WUR, and did competent pressure tests.. I've done ignition system based on distributor to EDIS conversion with MegaSquirt before. This is really stable setup - strong spark, easy to diagnose, and you can advance/retard your spark whenever you want it. I like things that are stock, the older I get. But for the DITC the mighty google is not much of a help. I've invested in new fuel injectors, second fuel distributor, did quite a lot of work with the fuel system - I will keep that stock for sure. I'll try to do some work on DITC. Some research, change the ignition module. If I fail here, I'll try to figure out kind of P'n'P setup with MS2 to replace DITC. I've seen some Ignition maps flying around the forum, so this might be a good starting point. The DITC is probably just fine. The ignition amplifier module is probably dead or almost dead, the one on the driver side wheel well, front of the car. Then the DITC connector needs a clean and the mother pins in the connector need a bit of mechanical deformation to make good contact with the father pins on the actual DITC. Then you may need a flywheel sensor. That i can sell you if you want. If not today morning when she just started by barely tourning ignition key, higky resposible to throttle movent, stable idle... I'd just leave it and plan switching to MS ignition. But this made me investigate.